The Tánaiste Simon Coveney has reiterated his view that Secretary of State for the North, Karen Bradley had done a ‘grave disservice’ to the Bloody Sunday families by claiming British Army killings in the North were not crimes. 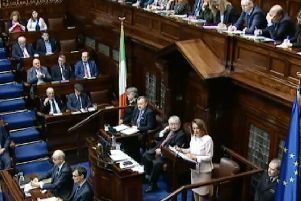 Mr. Coveney, equally, has said the Dublin Government will oppose any moves to introduce an amnesty from prosecution for either State or non-State actors suspected of involvement in killings during the conflict. He said: “As we know, the Secretary of State for NI recently made what she later acknowledged herself were some very wrong, insensitive and hurtful remarks in Westminster. “These were a cause of deep concern and did a grave disservice to victims’ families, who lost loved ones at the hands of state forces and who continue to seek justice and truth decades after their tragic loss. The Tánaiste said he welcomed Ms. Bradley’s commitment that where there was any evidence of wrongdoing it would be pursued “without fear or favour”. He added: “The Irish Government has been clear that we would not support any proposal to introduce amnesties for state or non-state actors. I reiterated that to the Secretary of State for NI at our last meeting in London two weeks ago. "The Government will also continue to engage with the British Government and with the political parties to get the Stormont House Agreement legacy institutions in place as quickly as possible.